Although teething is a natural part of your baby's dental development, it can be quite uncomfortable for them—and upsetting to you. 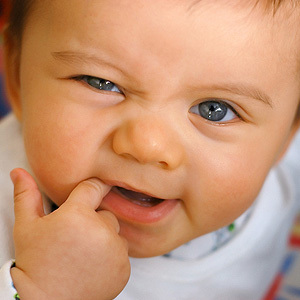 During teething, children can experience symptoms like pain, drooling or irritability. Teething is the two or three-year process of intermittent episodes of the primary ("baby") teeth moving through the gums. These episodes are like storms that build up and then subside after a few days. Your aim as a parent is to help your baby get through the "stormiest" times with as little discomfort as possible. To that end you may have considered using over-the-counter products that temporarily numb irritated gums. Some of those numbing products, however, contain a pain reliever called benzocaine. In recent years, this and similar ingredients have been found to increase the level of a protein called methemoglobin in the bloodstream. Too much methemoglobin can result in less oxygen delivered to body tissues, a condition known as methemoglobinemia. This oxygen decrease can cause shortness of breath, fatigue or dizziness. In its severest form it could lead to seizures, coma or even death. Children and infants are at high risk for benzocaine-induced methemoglobinemia, which is why the U.S. Food and Drug Administration has banned marketing for benzocaine products as pain relievers for teething infants and children. Fortunately, there are alternatives for helping your child weather teething episodes. A clean, chilled (not frozen) teething ring or pacifier, or a cold, wet washcloth can help numb gum pain. You can also massage their gums with a clean finger to help counteract the pressure exerted by an emerging tooth. Be sure, though, that you're not allowing anything in your child's mouth like lead-based paint that could be toxic. And under no circumstances should you use substances containing alcohol. For severe pain, consult your physician about using a pain reliever like acetaminophen or ibuprofen, and the proper dosage for your child. With these tips you can help your child safely pass through a teething episode. If you would like more information on helping your child cope with teething discomfort, please contact us or schedule an appointment for a consultation. Teething is a normal part of your baby’s dental development. That doesn’t make it less stressful, though, for you or your baby. This natural process occurs as your child’s primary teeth sequentially erupt through the gums over a period of two or three years. The first are usually the two lower front teeth followed by the two upper front ones, beginning (give or take a couple of months) between six and nine months. By the age of three, most children have all twenty of their primary teeth. The disruption to the gum tissues can cause a number of unpleasant side effects including gum swelling, facial rash, drooling, disrupted sleep patterns and decreased appetite. As a result a child can become irritable, bite and gnaw to relieve gum discomfort or rub their ears. Every child’s experience is different as well as their degree of pain and discomfort. As a tooth is about to erupt, you may notice symptoms increasing a few days before and after. The symptoms will then subside until the next tooth begins to erupt. In a way, teething is much like a storm—you mostly have to ride it out. However, that doesn’t mean you can’t lessen your child’s discomfort during the teething episode. For one thing, cold, soft items like teething rings, pacifiers or even a clean, wet washcloth your child can gnaw on will help relieve gum pressure. Chilling the item can have a pain-numbing effect—but avoid freezing temperatures, which can burn the tissues. You can also massage the gums with a clean finger to relieve pain. But don’t rub alcohol on their gums and only use numbing agents (like Benzocaine) for children older than two, and only with the advice and supervision of your healthcare provider. The use of acetaminophen or ibuprofen might also be used under the advice of your doctor. If you notice your child has diarrhea, extensive rashes or fever, contact your physician immediately—these aren’t normal teething symptoms and may indicate something more serious. And be sure to consult with us if you have any other questions or concerns. Teething can be a difficult time for your baby and family. But with these tips and a little “TLC” you can keep their discomfort to a minimum. Your sweet, happy baby has suddenly become a gnawing, drooling bundle of irritation. Don't worry, though, no one has switched babies on you. Your child is teething. For most children, their first teeth begin breaking through the gums around six to nine months. Usually by age three all twenty primary (“baby”) teeth have erupted. While the duration and intensity of teething differs among children, there are some common symptoms to expect. Top of the list, of course, is irritability from pain, discomfort and disrupted sleep. You'll also notice increased gnawing, ear rubbing, decreased appetite, gum swelling or facial rash brought on by increased saliva (drooling). Teething symptoms seem to increase about four days before a tooth begins to break through the gums and taper off about three days after. You may occasionally see bluish swellings along the gums known as eruption cysts. These typically aren't cause for concern: Â the cyst usually “pops” and disappears as the tooth breaks through it. On the other hand, diarrhea, body rashes or fever are causes for concern — if these occur you should call us or your pediatrician for an examination. Provide them a clean, soft teething ring or pacifier to gnaw or chew — a wet washcloth (or a cold treat for older children) may also work. Chill it first to provide a pain-reducing effect, but don't freeze it — that could burn the gums. Use a clean finger to massage swollen gums — gently rubbing the gums helps counteract the pressure caused by an erupting tooth. Alleviate persistent pain with medication — With your doctor's recommendation, you can give them a child's dosage of acetaminophen or ibuprofen (not aspirin), to take the edge off teething pain. There are also things you should not do, like applying rubbing alcohol to the gums or using products with Benzocaine®, a numbing agent, with children younger than two years of age. Be sure you consult us or a physician before administering any drugs. While it isn't pleasant at the time, teething is part of your child's dental development. With your help, you can ease their discomfort for the relatively short time it lasts. Singer Olivia Newton-John's daughter Chloe is now a lovely, grown woman, but Olivia recently recounted to Dear Doctor magazine a rather creative method she found to sooth Chloe's teething troubles many years ago. Cold is often very soothing to a teething child's gums. In fact, the American Academy of Pediatric Dentistry (AAPD) recommends using a clean, chilled, rubber teething ring, or cold wet washcloth. Chilled pacifiers can also be helpful. Be sure not to freeze teething rings or pacifiers as ice can actually burn sensitive mouth tissues. Occasionally, teething discomfort can be considerable. If that is the case with your baby, you can give her or him acetaminophen or ibuprofen in the appropriate dose (check with your pharmacist if you're not sure what that is). The medicine should be swallowed — not massaged into the gums, as this can also burn. Numbing agents should not be used for children under 2, except under the advice and supervision of a healthcare professional.